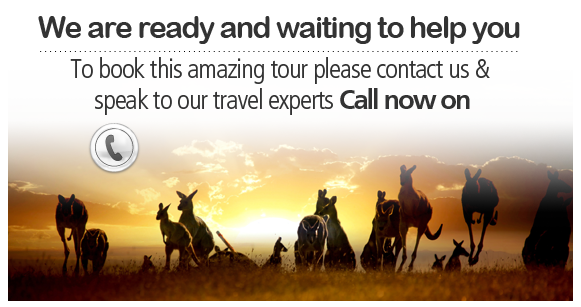 Staying in comfortable accommodation throughout, enjoy the journey of a lifetime as you travel around some of the most iconic landmarks of the Australian outback. Transfer to your hotel for evening welcome drinks. If arriving prior to midday join a local food expert for a guided tour of the 140-year old Adelaide Market. 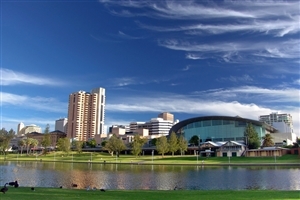 See the sights of Adelaide on an orientation tour before we make our way north and sample some local wines at Sevenhill Cellars, the oldest existing winery in the beautiful Clare Valley. 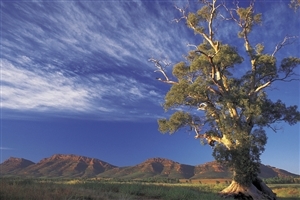 Later travel through the picturesque Flinders Ranges, recognised as one of Australia's national landscapes and into Wilpena Pound, a remarkable natural amphitheatre covering nearly 8,000 hectares. Enjoy time to explore Wilpena Pound. This afternoon travel through Pitchi Richi Pass to Port Augusta and visit the Wadlata Outback Centre. 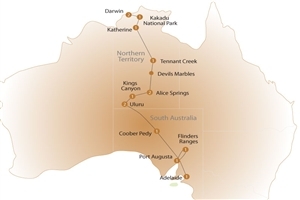 Visit Woomera, before travelling to isolated Coober Pedy, the opal capital! 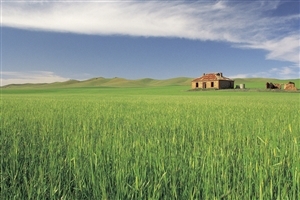 Visit an underground church and home. 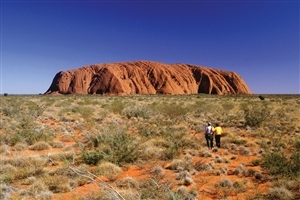 Cross into the Northern Territory and Ayers Rock. Watch the sun set over Uluru and return next morning for sunrise. After a guided walk into Mutitjulu Waterhole and the Uluru-Kata Tjuta Cultural Centre, walk into Walpa Gorge for another glorious sunset and a glass of sparkling wine. Marvel at Atila (Mt. Conner) the 'forgotten wonder of Central Australia'. Continue to Kings Creek Cattle Station, which is also the largest exporter of wild camels in Australia. A guided climb to Kings Canyon Rim rewards with views of Watarrka National Park. The less energetic may prefer to explore the canyon floor, an easier walk. Visit Anzac Hill en route to Alice Springs for panoramic views over this outback town. Next day, visit the Desert Park and Simpsons Gap waterhole before an outback barbecue and stargazing at the Earth Sanctuary Nature Centre. Visit the historic telegraph station, then travel north to view the precariously-balanced boulders known as the Devil’s Marbles. In Tennant Creek, visit historic Battery Hill Precinct, tour an underground mine and enjoy a barbecue dinner. Travel across vast outback stations with time for a dip in the thermal springs at Mataranka before continuing to Katherine. Cruise Katherine Gorge in Nitmiluk National Park and deep into Kakadu. Cruising the Yellow Water Billabong, look out for birdlife and, with luck, estuarine crocodiles basking in the muddy shallows. Stop at the Bowali Visitor Centre, climb the rocky outcrop of Ubirr and enjoy an arrival tour of tropical Darwin. See the mysterious magnetic termite mounds, the beautiful Florence and Wangi Falls, and enjoy this evening a dinner cruise on Darwin Harbour. Tour concludes with a transfer to Darwin Airport.